Thermochronology is the science of reconstructing the thermal evolution of the Earth. Analytical techniques used to do this depend on measuring the accumulation of a daughter product produced by radioactive decay of a parent nuclide. The key step in reconstructing robust thermal histories from these analyses is in understanding, and quantitatively modelling, the process of thermal diffusion and rate of loss of the daughter product from the minerals over geological time scales. The most widely used low temperature thermochronology techniques involve the analysis of single apatite crystals (Figure 1), a common accessory mineral in many crustal rocks. The techniques exploit the accumulation of helium produced by radioactive alpha-decay of 235U, 238U and 232Th and production of fission tracks by fission decay of 238U. Combining accurate and computationally efficient algorithms to model the thermal diffusion and thermal annealing processes within individual grains (at a scale of micrometres) with algorithms that are able to exploit very large, spatially distributed data sets covering hundreds or even thousands of square kilometres is a major computational challenge. This project aims to develop and apply new computationally efficient algorithms and inversion techniques that will enable joint inversion of multi-method, widely distributed and very large thermochronology data sets to provide robust regional models of the thermal evolution of the Earth’s crust over geological time scales. Figure 1. 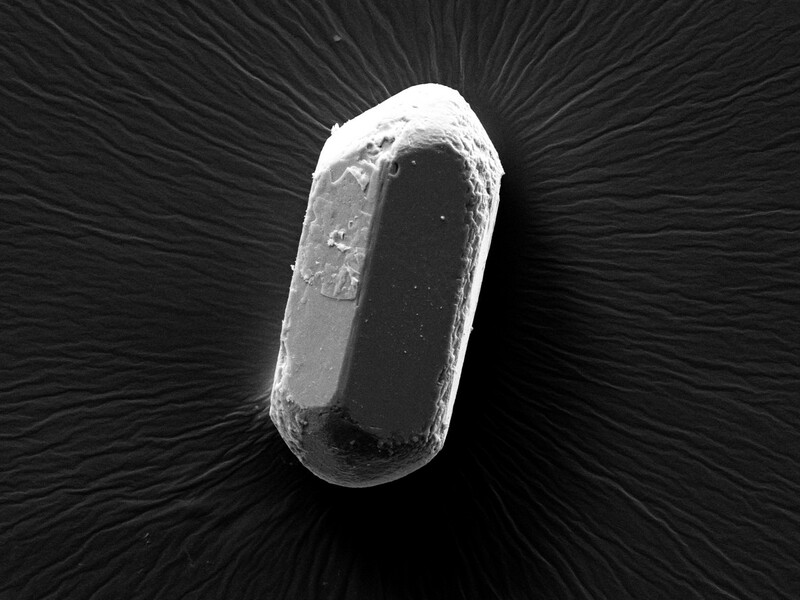 Image of a single apatite crystal (length of crystal is c. 250 µm) produced by Back Scattered Electron (BSE) mode under a Scanning Electron Microscope (SEM). For more information about the project contact Prof Roderick Brown (Roderick.Brown [at] glasgow [dot] ac [dot] uk) at the School of Geographical & Earth Sciences at the University of Glasgow. Beucher, R., Brown, R. W., Roper, S., Stuart, F., & Persano, C. (2013). Natural age dispersion arising from the analysis of broken crystals: Part II. Practical application to apatite (U–Th)/He thermochronometry. Geochimica et Cosmochimica Acta, 120, 395-416. Brown, R. W., Beucher, R., Roper, S., Persano, C., Stuart, F., & Fitzgerald, P. (2013). Natural age dispersion arising from the analysis of broken crystals. Part I: Theoretical basis and implications for the apatite (U–Th)/He thermochronometer. Geochimica et Cosmochimica Acta, 122, 478-497. Gallagher, K., Stephenson, J., Brown, R., Holmes, C., & Ballester, P. (2005). Exploiting 3D spatial sampling in inverse modeling of thermochronological data. Reviews in mineralogy and geochemistry, 58(1), 375-387. Gallagher, K., Stephenson, J., Brown, R., Holmes, C., & Fitzgerald, P. (2005). Low temperature thermochronology and modeling strategies for multiple samples 1: Vertical profiles. Earth and Planetary Science Letters, 237(1), 193-208.